This is a favoured exercise of leading Canadian back specialist Professor Stuart McGill. Rest on your hands and knees and imagine a glass of wine on your back which you don’t want to spill. You shoulder blades should be nice and wide, lift up into the breastbone. Lengthen the opposite hand and opposite leg away from each other, and only rise as far as your tabletop flat back. Remember to lift the abdomen. Keep the movement fluid and then perform on the opposite side. Always seek appropriate professional advice prior to any new exercise activity. If you experience any discomfort, please seek medical attention. Welcome to The Osteopathic Clinic - Croydon, a prestigious and widely respected multi-disciplinary practice set in the South East of England. Our modern and comfortably furnished clinics are located in Croydon and Warlingham and afford clients the chance to relax whilst being treated. Based in Addiscombe, our flagship clinic is often described as a sanctuary by our patients, with many arriving early to relax on our comfortable leather sofas or flick through the latest magazines before being escorted to their private treatment room. 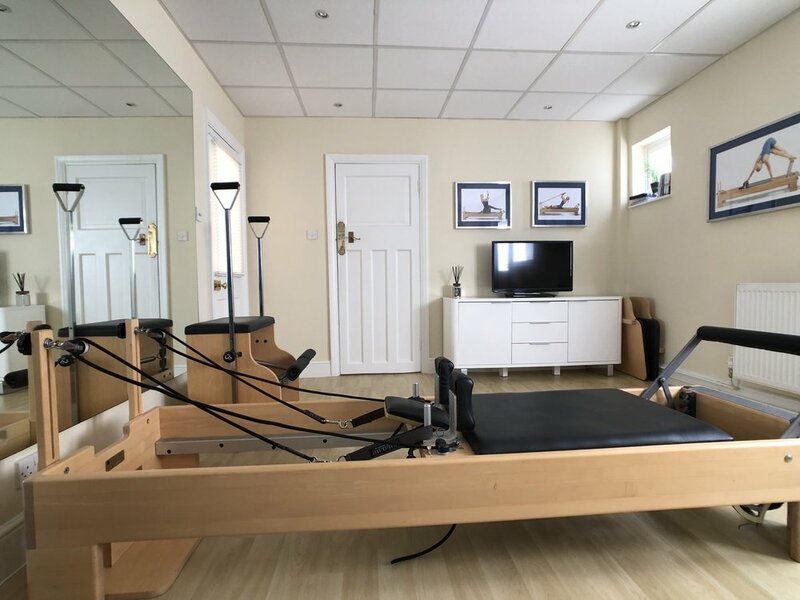 Our state-of-the-art glass-house pilates studio is bathed in natural light and surrounded by a pretty manicured landscaped garden, making it a wonderfully relaxing space in which to strengthen, tone and rehabilitate the body. Situated in a quiet, tree-lined street, the clinic is easily accessible by public transport and there is also free on-street parking. Have a look at the principle taking you on a clinic tour. Located in the charming setting of Warlingham, this clinic is a stone’s throw away from the green and shares a building with the Warlingham Green Medical Practice. Services provided in conjunction with osteopathic treatment, include Shockwave Therapy, laser therapy, electro-therapy, dry needling and ultrasound. We offer state-of-the-art equipment for our Osteopathic team. There’s also plenty of free on-street parking. Our services include osteopathy, physiotherapy, clinical pilates, Shockwave Therapy, post op rehabilitation and an academy that treats golf, sports and dance injuries. All our osteopaths are fully qualified members of the General Osteopathic Council, and we pride ourselves on the fact that our reputation has been built by word of mouth and attract the finest practitioners with many years of experience. Our trustworthy team of professionals is dedicated to providing the highest standards of one-to-one care, using evidence-based techniques. Offering a first class, competitively priced, holistic service that makes a difference to the lives of clients regardless of their age or background has always been our vision. Our practitioners provide support every step of the way, from consultation and treatment through to aftercare and advice, in order to promote optimum health and wellbeing. We pride ourselves on providing the best care, treatment, and facilities, so you have the best environment for a full recovery and a program to support an active lifestyle. Our community of patients, partners and our team bring an additional element to make everyone's experience better. Paul Morrissey has treated me for over 20 years; initially for sports related injuries and more recently as part of my self maintenance regime.